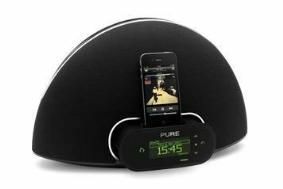 CES 2011: Pure reveals Contour iPod dock with streaming and web radio | What Hi-Fi? Priced at £199.99, it's the seventh model in Pure's range of Flow connected radios. The retractable dock will charge your iPhone or iPod, and with built-in wi-fi you can stream music from your computer or media server as well as listen to thousands of internet radio stations. You also get component, S-Video and composite outputs to view videos stored on your portable through your TV. Pure's Clearsound technology is designed to ensure "clear, dynamic audio, higher volume levels and low power consumption". Contour has an acoustically tuned and sealed cabinet with dual bass ports, backlit touch-sensitive controls and a black crescent shape. Like other Pure Flow radios, Contour is compatible with FlowSongs, a cloud-based music service that allows the listener to identify songs playing on the radio and purchase the tracks for download. Other features include FM radio, a 3.5mm aux input, 3.5mm stereo headphone jack, USB connectivity and EcoPlus, Pure's commitment to reducing power consumption and excess packaging. Pure has also announced that it will release an improved version of its internet portal, The Lounge, later this month.